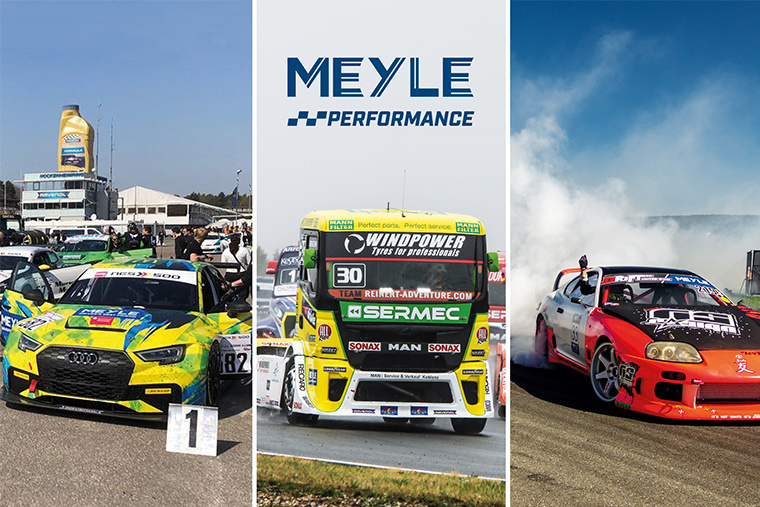 Hamburg, 05 April 2019: In 2019, the Hamburg-based manufacturer MEYLE will again be actively involved in motor sports and will continue its sponsoring activities in truck racing and in the DRIFT UNITED racing series. In addition, MEYLE will be the official sponsor of the team T3 Motorsport in the ADAC GT Masters, 24H Series and NES 500 series. In the truck racing, the drifting scene and now also in touring car racing, MEYLE provides support where vehicles and their parts have to withstand the highest loads under maximum performance. MEYLE has been involved in truck racing since 2014 and will continue to do so in 2019. In the coming season, MEYLE support the team around racing driver Sascha Lenz in the FIA European Truck Racing Championship racing series. In addition to the technical equipment of the more than 1,000 hp racing truck with high-quality MEYLE parts, MEYLE engineers will be available as technical partners on the race weekends and in the workshops. This year MEYLE expands its activities by a commitment in another professional racing series with the team T3 Motorsport GmbH. Together with MEYLE as sponsor, the team will start the 13th edition of the ADAC GT Masters with an Audi R8 LMS GT3. The MEYLE engineers will support the team around the young drivers Maximilian Paul and Simon Reicher with their technical expertise. At the same time, MEYLE is also supporting T3 Motorsport’s junior development programme, which uses an AUDI RS3 LMS TCR and a VW Scirocco Cup. The vehicles and the team will not only be shown in the NES 500 but also in the 24H Series. The new ADAC GT Masters season starts on 26 April 2019 at Oschersleben. The official pre-season test of the ADAC GT Masters will also take place in the Magdeburger Börde on 9 and 10 April 2019. In addition to these involvements, MEYLE will again be the main sponsor of the popular German drift series DRIFT UNITED in 2019. Through the analysis of installed inserts, valuable findings are collected for the further development of the products Last year, this collaboration resulted in a prototype of a front axle for an individual drift vehicle. Its development and test operation were carried out hand in hand with DRIFT UNITED. For MEYLE, motor sports are a subject with tradition: As a passionate racing driver in South America, company founder Wulf Gaertner himself was faced with the challenge of obtaining high-quality spare parts for his racing car – which he finally purchased from Germany and thus laid the foundation for export trade. Many of the more than 50 MEYLE engineers are motorsport enthusiasts themselves – as the company founder Wulf Gaertner was. The partnerships in motor sports are the result of personal passion coupled with engineering work in OEM quality.